Alex the Allegator 4 is a fun platformer that harks back to the good old days of 8-bit Nintendo games. 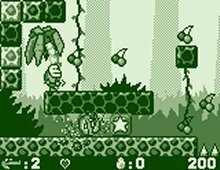 Similar to Douglas Circumstance, Alex 4 features excellent anime-style animations, addictive side-scrolling gameplay, and a limited but well-implemented 8-bit palette (in green tones, no less) that Gameboy fans will be familiar with. In true Super Mario fashion, you will jump, run, and collect various fruits, bonus items, and power-ups on your way to the exit, level after level. Alex 4 is not a long game, but it is long enough to keep you entertained for at least 5-6 hours - much longer if you are not a joystick experts. I find the screen size too small for my 1024x768 monitor, and there was no option to adjust it. But then again, if nitpicking about small screen size is the only gripe I can think of about a game, that is probably a good sign of how good it is. Two thumbs up, way up!